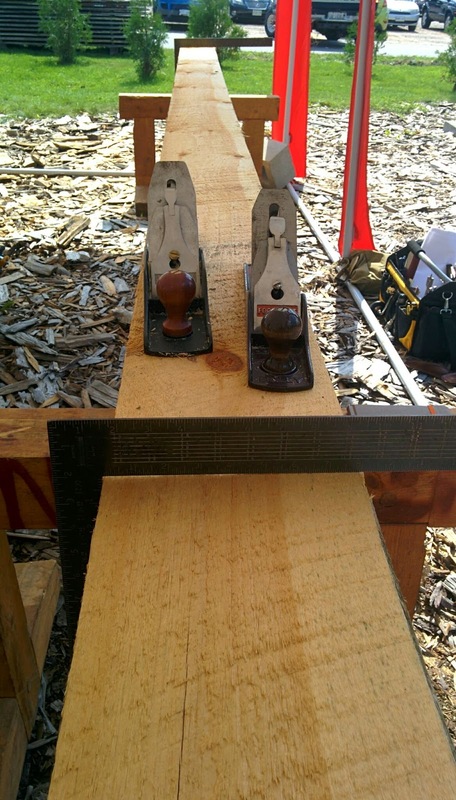 In my last blog post (Timber Framing day 1) I talked about the project we are working over this semester at my college. 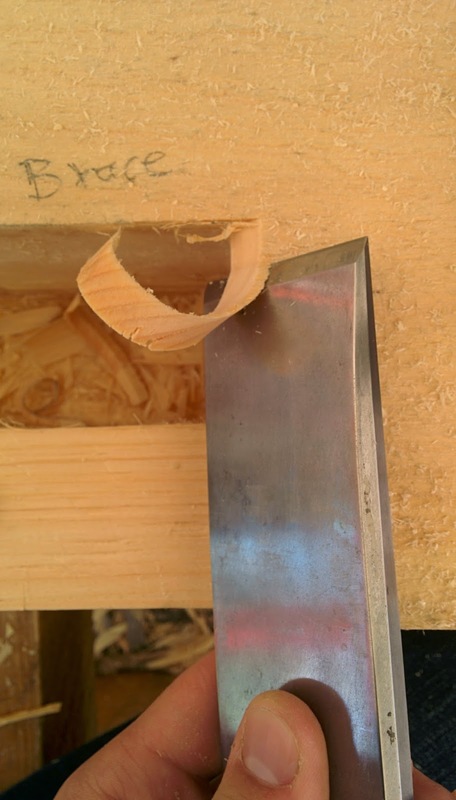 The first thing to know is that Traditional Timber Framing uses Mortise and Tenon joinery that are than pinned together so the joint does NOT come apart on its own. Traditional timber Framing uses no nails, the frame is staying together only because of tight joinery and a good design. In order to make nice and smooths cuts you have to have a nice sharp chisel and a chisel that is big enough to work on big timbers, if you would work with a regular chisel on a timber you would spend weeks on a cut. 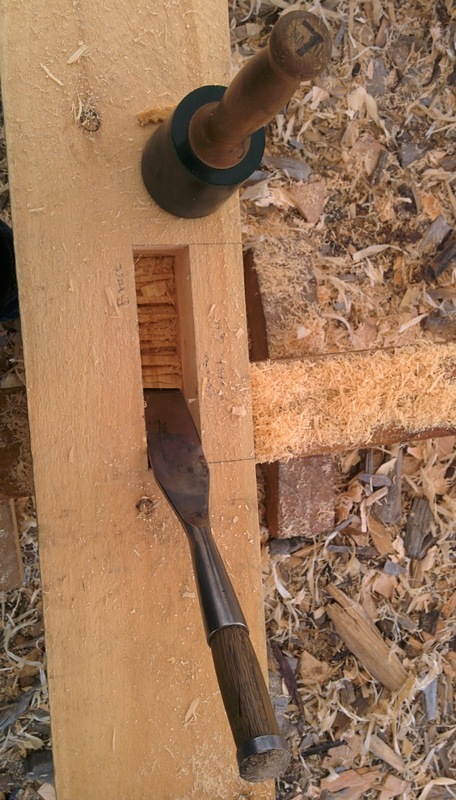 We used 2 types of chisels, the normal Timber Framing chisels and the Slick chisels. The difference between the two is simple; the Slick Chisel is much bigger and you dont use a mallet (Mallet is a type of hammer) on it, the timber frame chisel is smaller and you can use a mallet on it. Mallet can can be made out of wood or hard plastic and be different sizes or shapes. 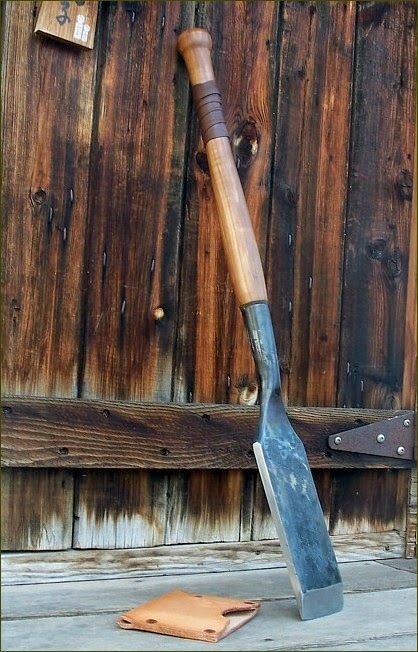 At the college we used a Hard plastic/rubber one with a wooden handle. 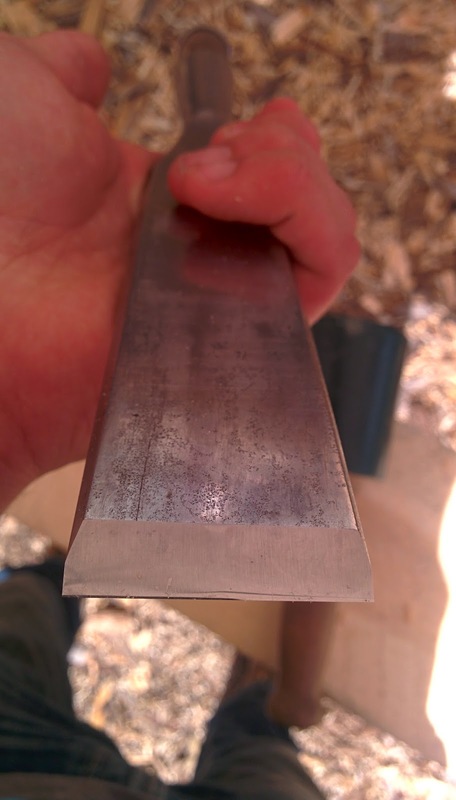 Like I said having a sharp Chisel makes a huge difference performance and time wise! 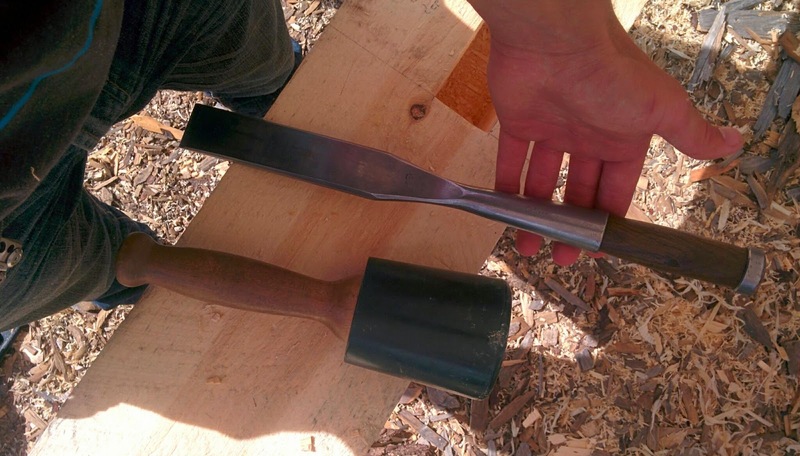 On the left picture I am cleaning up my mortise that I made with my Chain mortiser. There is many ways you can cut different parts for the framing, We got to try all of them. 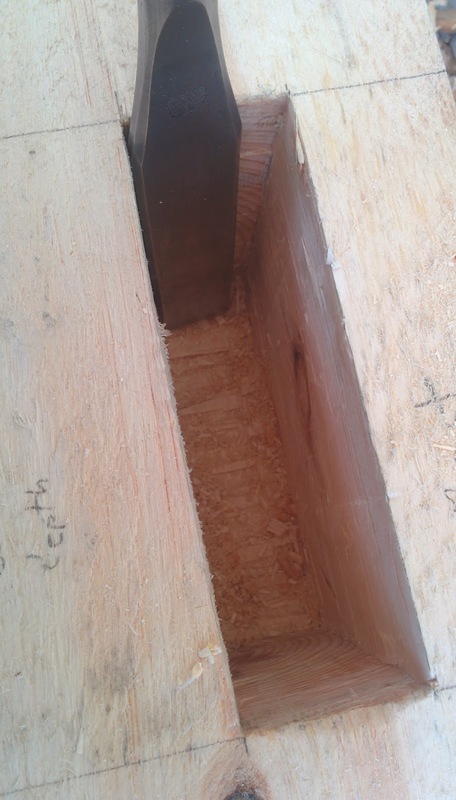 There is many different ways of preparing a timber for layout ;we used the "Square rule" for our project. 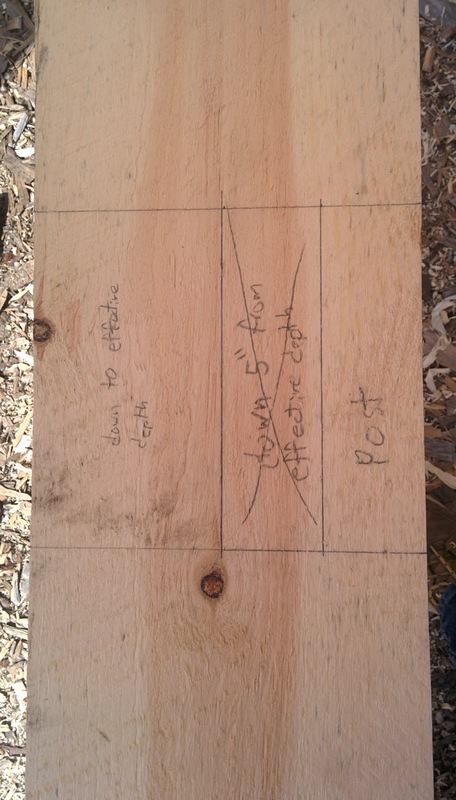 Using the square rule reduces the number of times a timber needs to be moved and therefor everything is more efficient and also everything is laid out logically trough out the project on each timber what makes it easy for dummies like me! I will try to explain the square rule my self as best as possible:The Term "Square Rule was Coined to Edward Shawn in the 1830s in one of his books. 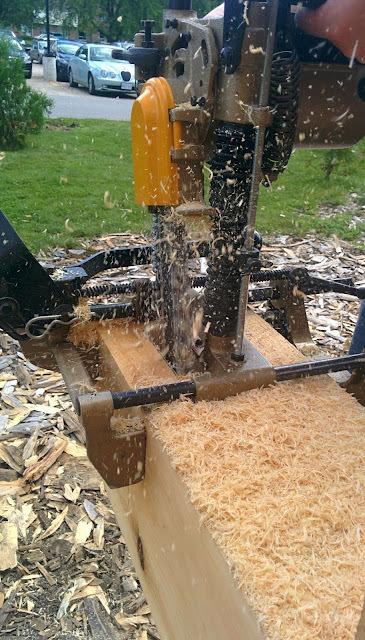 Its based on the idea that within every irregular, rough sawn timber lies a slightly smaller perfect timber. 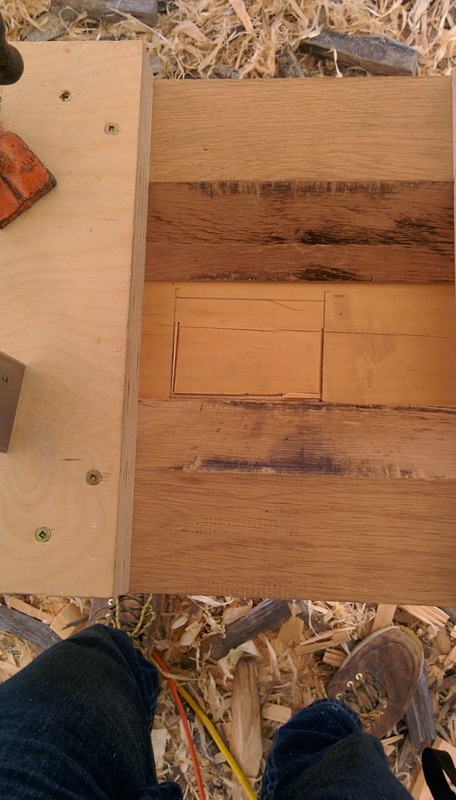 All joinery is cut to this inner timber, which usually shares two adjacent square faces. This way it does not matter if all the timbers are different, you have two lay out faces that you measure from to do your layout. 1. Make sure your primary face is flat, than make sure that your secondary face is flat as well and square to your primary face. 2. 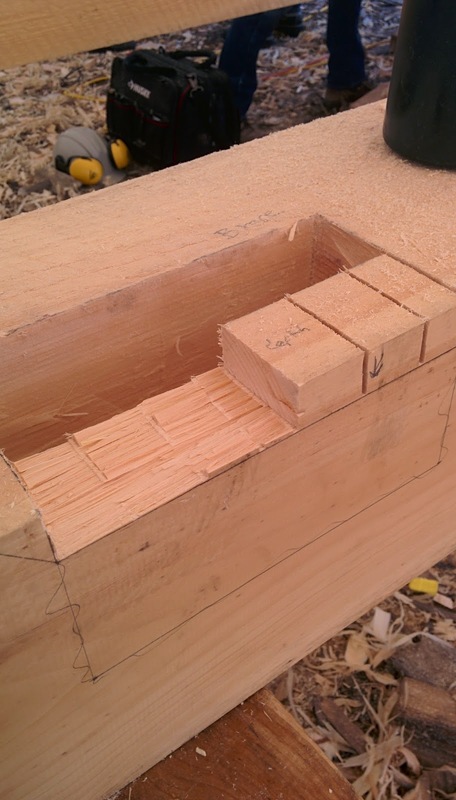 Layout all your joinery from your primary face / Layout face. 3. 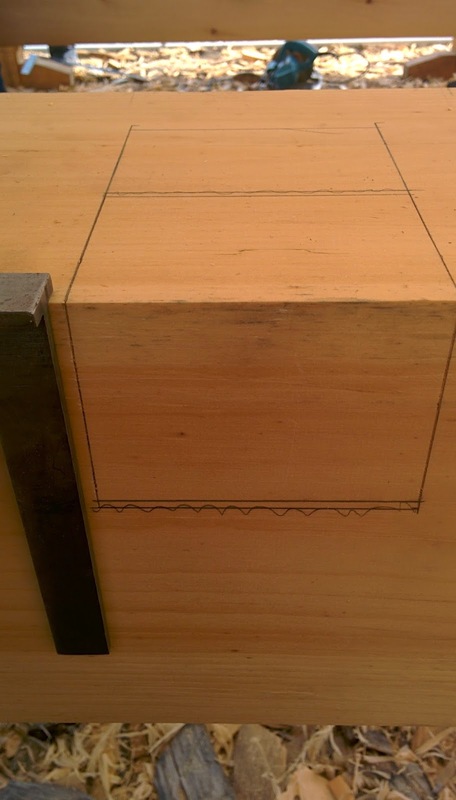 Draw your joinery on all surfaces including the other non layout faces. 4. Cut according to your layout and hope it is all right! 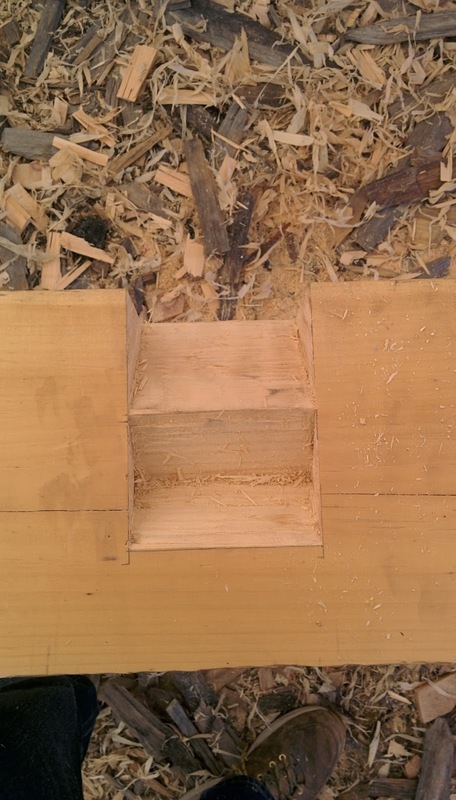 Here I laid out my Step lapped mortise for my Rafters on my plate. 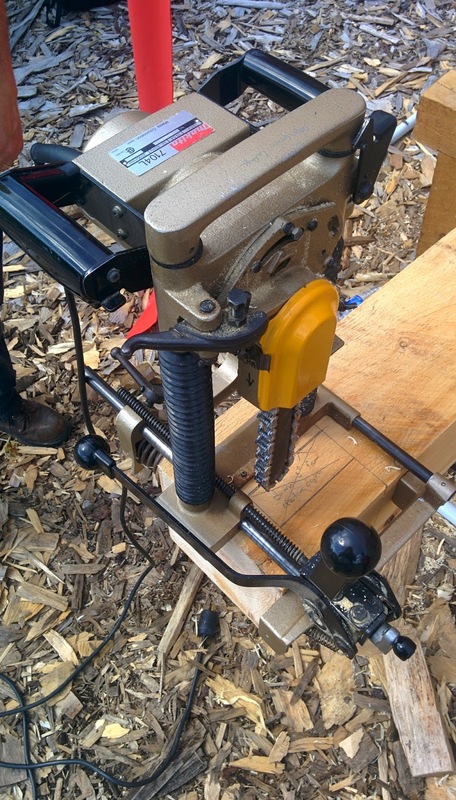 Using a jig that helps me a 45 Degree angle I start Chiseling my way trough the wood. By the end this is what it should be looking like. The rafter will be sitting on there, it will be nice and strong. 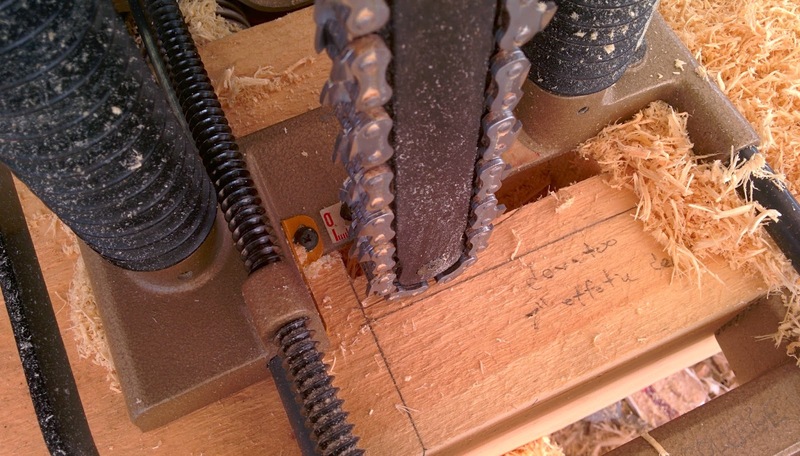 Using a chain mortiser you can cut a Mortise in a a couple of minutes. Have your layout ready, set up your Chain mortiser by placing it on and locking it in place, set it to the right depth and than start drilling /cutting! I did not set the chain mortiser to the right depth, I was missing half an inch roughly. I decided instead of setting everything up again with the chain mortiser that I will just take my chisel and hammer my way until where i want to be depth wise. Doing the final adjustment with the chisel on the mortise. 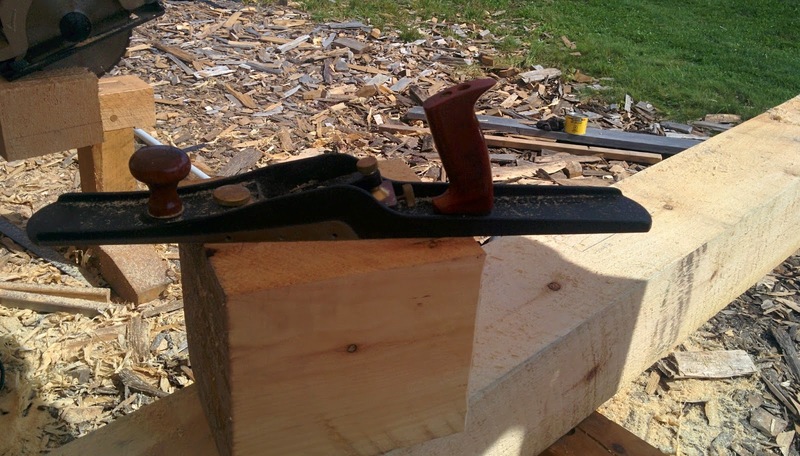 You know your chisel is sharp with it cuts wood like a hot knife trough butter! My second year college classes started about a week ago, and one of the classes we have is timber framing. In 7-8 weeks we learn and build a 16'-8' timber frame building from scratch. My class is 16 people strong and at have roughly 7-8 hours a week to work on this. We started by making teams off 2 and each group had to choose one section of the timber frame that they are going to make. 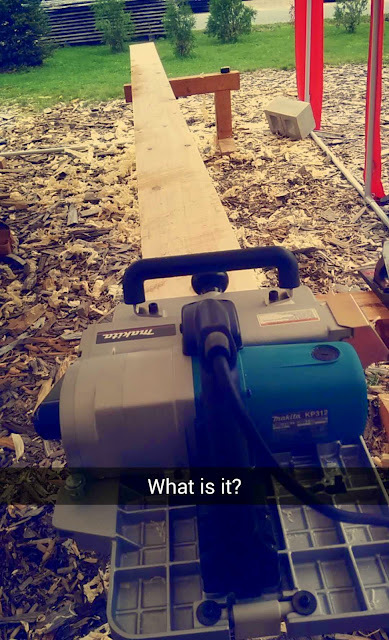 Me and my partner choose the top plate, it takes the longest amount of time Because you have to do a lot of chisel work and cutting for the rafters (for the roof), braces(support) and beams but we figured it would be fun and interesting. I'm a couple of days into the project now and will up load some pictures ever couple of days trying to explain each step we did with pictures to follow And after we are done I will make one big blog post. The drive home/road trip was quite long, 3200 km trough hills, trees, flatland, fog and rain but really fun and a great adventure that I shared with my girlfriend who was so awesome to fly up from Ontario to drive home with me. We started driving on Friday, I picked up Hannah from the Saskatchewan airport at 10 am in the morning and we drove directly to Regina what as 600 km away from us. The most impressive thing in SK are probably the long trains, the huge Fields and the huge grain elevators that show up every ones in a while. We got out of the car on the high way to take a couple of pictures of the train that stopped. I guess the train driver saw us since he honked twice what scared the living ****out of us haha. It was Hannahs Birthday 2 days before she came down so I bought here a little present, I am not very got at rapping gifts how you can probably tell on the picture below. I thought if I cant be the best I can be at least the worst. First night we stayed in Regina at the best western hotel. (I used the "Hotels.com" phone app on my android phone to get really good deals on hotels). On our way to Winnipeg we had nice weather. We stopped in "Moose Jaw" to see the underground tunnels and the very old and pretty town. As soon as we left SK and got into Manitoba the weather got really bad. rainy all the way till Winnipeg were we stayed for the night. But before we arrived in Winnipeg we found a little hidden Museum called "Old Georges Museum and Hidden village". I have to admit that we first were not really sure if we should go in since it did look a bit creepy from the outside but as soon as we got in we were stunned by the amount of old antiques Old George collected over his life time. The whole house was filled with old stuff and just when you thought you saw it all we did find more. George was so kind and showed us around his Museum and told us his story about how he started collecting. He had millions of antique items at his museum and I bet he knew each one of them with a unique and interesting story. After we finished the tour in the Museum Gorge offered us a quick tour trough is village, we did not had a lot of time since we were planning on driving to Winnipeg but we still did it and it really payed off!!! Over his life time he build his own little outdoor village that included over 20 different building from Blacksmith, Bar, Antique shoe store... You could even stay for the night in one of his old log houses for a small amount of money. "Dont Smile" he said, harder than it looks! On our way than to Winnipeg we had bad weather and rain all the way trough. We found a place to stay near the airport at the Best western. From Winnipeg we drove to Thunder Bay Ontario. We took the longer rout along the big lakes, even though it took longer it was worth it since some of the views you had were amazing and it is also really fun to drive! We stayed in Thunder Bay for the night and were planning on camping at the "Sleeping Giant park" for the night the next day. The next day turned out not as nice as planned it rained all night so we decided to not go camping and just do a day trip to the park. We arrived at the "Sleeping Giant park" at 10 am in the Morning and it was so cloudy you could not see 20 ft ahead of you.. There were a couple of different trails you could take to see the Giant rocks of the park, the trail we walked took us almost 3-4 hours and when we finally got to the view point it was so cloudy we were not able to see a thing.. Since we did not go camping at the Sleeping Giant park we decided to go camping near the Lake superior (Canadas largest, Coldest and deepest lake). We were lucky to get a camp side right on the beach two steeps away from the water with the most amazing few ever! Even tough we only had a small tent, a BBQ some fire wood and some food we were more than happy! Hannah lit the Fire and I got the little BBQ ready Potatoes, Beef, Veggie burgers and a bit to drink did it for the night! Even Though the water was quite cold we decided to take a little swim and do our "Ice bucket challenge" In the lake. From the Lake superior we drove to North bay were we stayed the night and from North bay we drove home to Smiths Falls were our 6 day road trip ended. 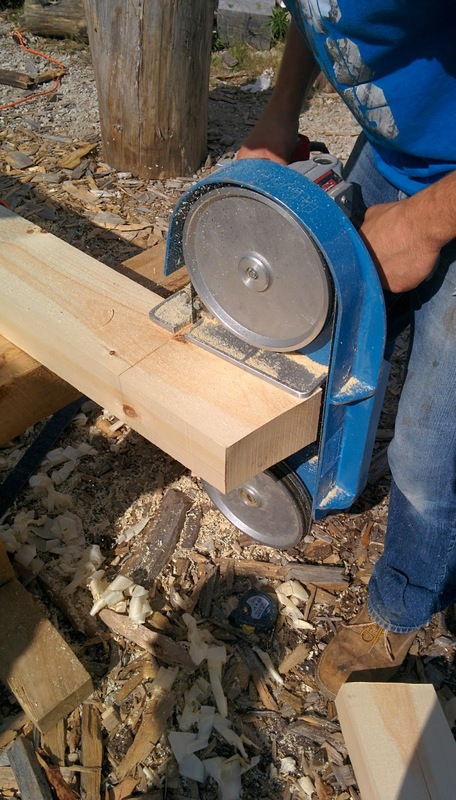 I moved from Germany to Canada in 2009, I am a young Carpenter In my second year of schooling as a "Heritage Carpenter" at the Algonquin College In Perth. I truly love my trait as a woodworker! 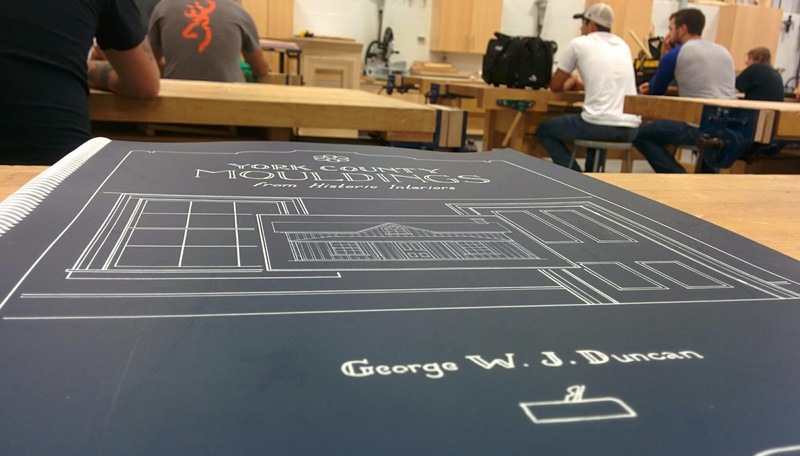 I enjoy building and modern furniture, fine woodworking as well as working on Heritage building. In the right Direction "